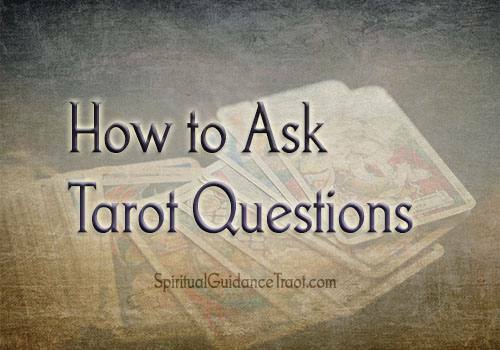 Ever struggled coming up with questions to ask for a Tarot reading? Learn how to form the best questions for your readings and see some great examples. Tarot works best when focused on a tight question within a reasonable time frame. “Will I ever” questions are not well suited to Tarot. Why? Well, ever is a mighty long time now, isn’t it? Every day we make choices that impact the course of our path. Tarot is good for seeing short-term energies and patterns and adjusting our behaviors accordingly. “Ever” is just too vague and too many things can happen. For this reason, keep your spreads and/or your questions to a specific time frame. Six months to a year are ideal for longer-range readings. You also want to avoid asking the same thing in different ways. When a question is emotionally charged, or we are not hearing what we want to hear etc. there can be a temptation to rephrase the same question in different ways. This is not helpful and will only cause confusion. Do your spread or ask your question at a time where you can be calm and open to all possibilities. Wrong: Will I ever get a job as a nurse at XYZ hospital? Better: Will a position at XYZ hospital open up in the next six months? What do I need to be aware of to increase my chances of getting a nursing position at XYZ hospital? The next involves love and relationship Tarot readings. Wrong: How does Dan feel about me? Does he care for me at all? Will he ever love me? What are Dan’s intentions towards a relationship with me? These are all clear, concise questions that are not emotionally driven asking the same thing over and over…. These questions are far less likely to create confusion and add to any emotional turmoil. Wrong: When will I be happy? Right: What can I do right now to improve my outlook and overall sense of happiness? The top one assumes you are powerless and happiness is something that will come galloping over the horizon one day and land in your lap. That’s not what happiness is. Happiness is a choice ultimately, so when you are struggling to feel happy, rather than seeking it as some distant objective, focus on what you can do to empower yourself right now that will start to turn things around for you. Hopefully, these examples give you some ideas on how to improve your Tarot questions. If you need help formulating a question feel free to contact me in the comments or via my contact form.